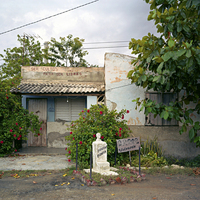 Photographer and Senior Lecturer Virginia Beahan presents "Cuba: Between the Future and the Past"
Join the Studio Art Department for Breakfast with the Arts with Photographer and Senior Lecturer Virginia Beahan. Virginia Beahan received her BA in English from Pennsylvania State University and her MFA from Tyler School of Art. Since then she has traveled extensively making landscape photographs with her 8”x10” Deardorff view camera, earning grants and fellowships from the Pennsylvania Council for the Arts, the Mellon Foundation, and the John Simon Guggenheim Memorial Foundation. This exhibition will feature photographs from Beahan’s published Cuba work as well as new images from the transitional economic years post Fidel Castro. The Metropolitan Museum of Art, San Francisco MoMA, the J. Paul Getty Museum, Museum of Contemporary Art San Diego, and the Houston Museum of Fine Arts, are among the many institutions that have collected Beahan’s photographs.